Remind your granddaughter that she will always have your love with this poetic piece. 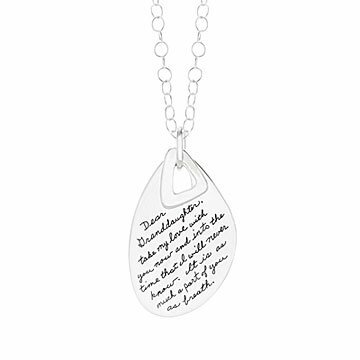 BB Becker's poetic pendant captures grandparents' profound love and dreams for their granddaughter. Each piece is engraved with the handwriting of the artist's wife, Josephine, adding a personal and intimate touch to this sterling silver necklace. Whether given to your granddaughter as she departs for college, moves across the world, or begins a new chapter in life, this heartfelt piece is a reminder that no matter where life takes her, she will never be without the love and support of her grandparents. "Dear Granddaughter, take my love with you now and into the time that I will never know. It is as much a part of you as breath." The preferred method of cleaning is to rub with a soft, clean, lint-free cloth. To remove oxidation rub gently with a paste of water and baking soda, rinse thoroughly and dry. Use of some dipping solutions, abrasive cleansers, or anything other than a soft, clean cloth may damage the finish. My Granddaughter has worn this necklace on several occasions and always gets compliments about how pretty and meaningful it is. This is perfect for what I wanted to say to her but didn't know how! She cried with joy when I gave it to her. She will always have this to remember how I felt about her when I'm gone. My granddaughter loves it and says she is going to wear it everyday. A very unique gift and good quality.